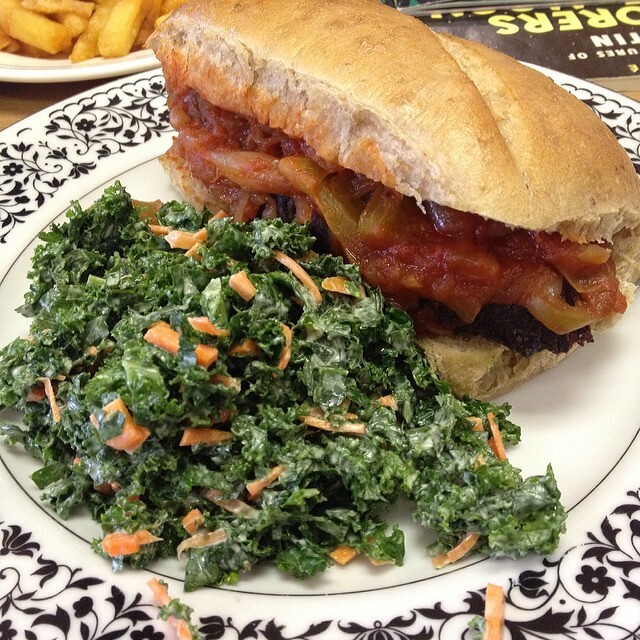 Killer Vegan is a diner and delicatessen in Union, NJ. I love this place. They started off small with only a few sandwiches and sides and a twice a month all you can eat brunch. Yes an ALL YOU CAN EAT VEGAN BRUNCH! They have burgers, panini’s, sausage and meatball sandwiches, new dinner specials every week, disco fries (! ), cheese fries (!) homemade cakes, cookies, milkshakes and more! I’ve been here a handful of times already and it’s been fun to see their menu and hours of operation grow. My last visit their I had the new Killer Vegan Panini. 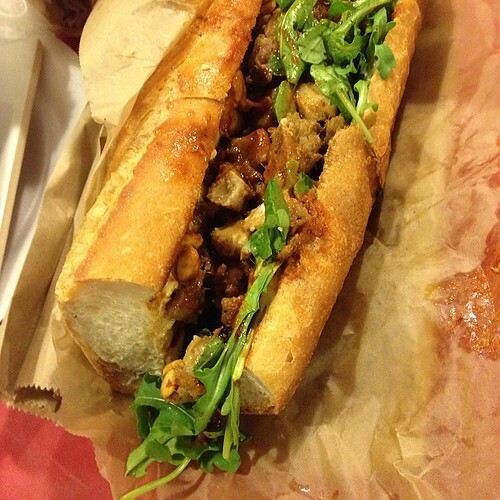 Filled with Country Fried Seitan, avocado, arugula, tomato, onion and chipotle mayo. It was perfectly paired with the kale slaw. The seitan was so delicious I wish I had a plate of it to myself! Brunch at Killer Vegan is alway’s All-You-Can-Eat and alway’s amazing. 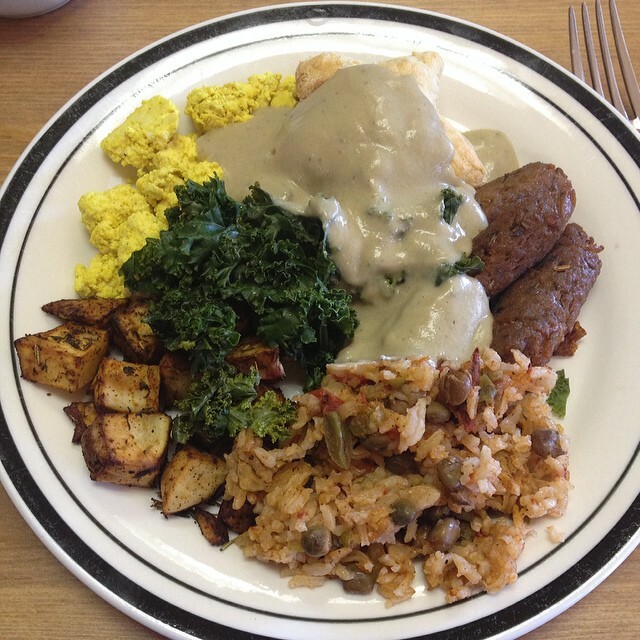 A buffet filled with homemade sausages and tempeh bacon, biscuits and a cashew sage gravy, tofu scramble, steamed greens, arroz con gandules, pancakes, french toast and home fries. On one or two occasions I’ve also spotted and dined on some deliciously sweet plantains. Their burger menu has grown from 1 burger to 4 different burgers including the original KV Burger (pictured), the Gunslinger Burger, which my husband enjoyed on our last kidless visit there, a Pizza Burger and The Killer, which I’m looking forward to trying the next time I visit. Its 2 burgers, cheese sauce, sauteed onions and coconut bacon. I can’t say no to Coconut Bacon! The burgers are house-made, delicious and they don’t fall apart. I’ve never been disappointed. One of my favorite things about Killer Vegan is that they make their own sausages. I love store-bought vegan sausages and buy them all the time for convenience but when a restaurant goes out of their way to make their own it’s special and I notice and I eat them. Nothing beats a house-made sausage and pepper sandwich! If you can’t tell by these pictures I really dig Killer Vegans Kale Slaw. When you order a sandwich it comes with chips or you can upgrade to one of their sides. I alway’s upgrade to Kale Slaw. It tastes exactly how I make my own Kale Slaw at home and I really should go for one of their other sides like Roasted Brussels Sprouts, Fries or Mashed Potatoes but I just really love Kale Slaw! Not pictured are the vegan Milk Shakes and desserts I’ve tried at Killer Vegan. Nine different Milkshake flavors from Mint Chocolate Chip to Butter Pecan and desserts like Red Velvet cake, Chocolate Chip Cookies, Mini Cupcakes, Peanut Butter Chocolate Cake and a Cookies and Cream Cake. 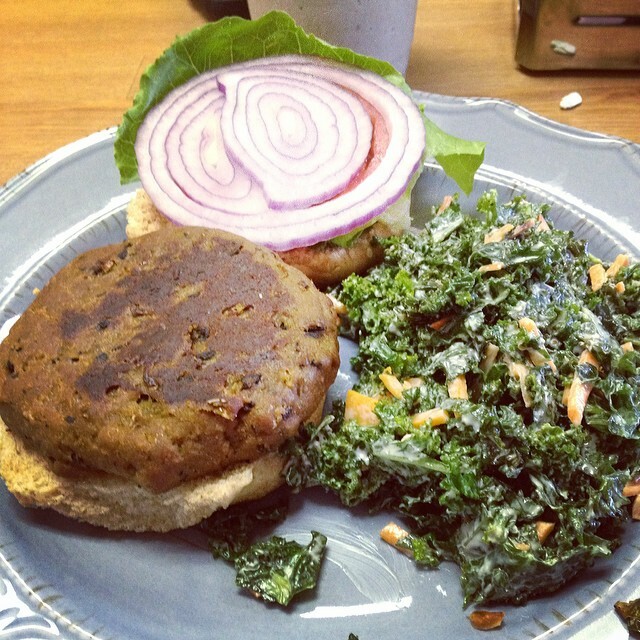 I could live happily eating at Killer Vegan forever! If you are in the area take a peek at their menu and plan a trip to eat here! I’ve been having a very busy summer so far with the kids home and no summer camps lined up. I regret it a little bit each day but we are also having a lot of fun together. We’ve been to the beach, put up a pretty big pool in our yard, saw some fireworks, went to the State Fair and are gearing up for our annual vacation to the Jersey Shore in a little bit. In between all of this I’ve been cooking up a storm. I have a new museli recipe ready to go, some smoothies, a blended coffee drink, a protein packed tomato sauce that is delicious on pizza and the kids have no idea what’s in it, a kale salad and a quinoa salad. I’m pumped about all of it. I also have to finish my eating out recap of Austin, Tx. I’m still dreaming of Bouldin Creek Cafe and Arlo’s. 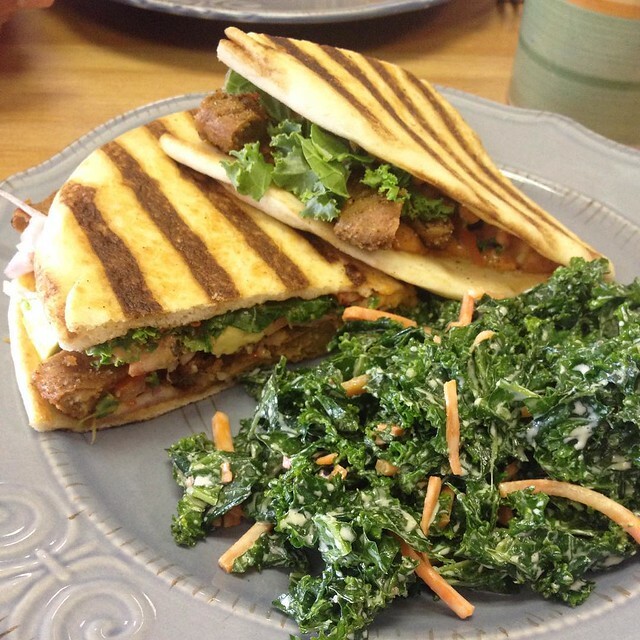 In the meantime here are some of our summertime eats from the last month. We’ve been eating quite well and I desperately need to get back to the YMCA! Romaine, cucumbers, orange bell peppers, red onions, sunflower seeds, capers, nooch and a Just Mayo based Caesar dressing. This was very refreshing on a hot day. We enjoyed these Milkshakes after the Caesar Salad above. We celebrated the 4th of July, at home, potluck style with my parents. I made the kale salad and quinoa-chickpea salad along with Field Roast Sausage Rolls and my mom made the potato salad (alway’s leaving some without mayo for me so I can add my own vegan mayo) and some delicious baked beans. You can find the baked beans recipe here! Yesterday was the last day of VeganMoFo 2014! This past “mofo” was definitely one of my more successful ones over the past few years. I don’t know how other bloggers with kids are able to keep up with their blogs. Its not easy for me. Maybe now that my son is older and starting preschool any day now is what helped me have more time to blog this past month. Lets hope to keeping it easier for me to blog because I’ve really grown to love it again. Today I’m going to tell you about a super simple Lentil Salad I made over the weekend. No cooking involved at all! Thanks to the help of packaged precooked lentils! When we have family functions..etc..to attend I have to pack food. For me, for my kids and usually for my husband. Him being vegetarian means there is usually something for him to eat. My kids are also vegetarian but are picky children so if we are going to be out all day I pack snacks and sandwiches for them. Me..well as you know I’m vegan. There isn’t going to be much if at all anything for me to eat. I usually just go the route of making some type of wrap for my husband and I. Its easy, it’s small, I’m not pulling out a full cooked for me at a restaurant or a someones house and they fit in my cooler backpack. Yes, a cooler backpack. A cooler you wear on your back! Its the best thing I’ve purchased for us in years because it can also hold all of my personal belongings and it just looks like a backpack. I’m in love. 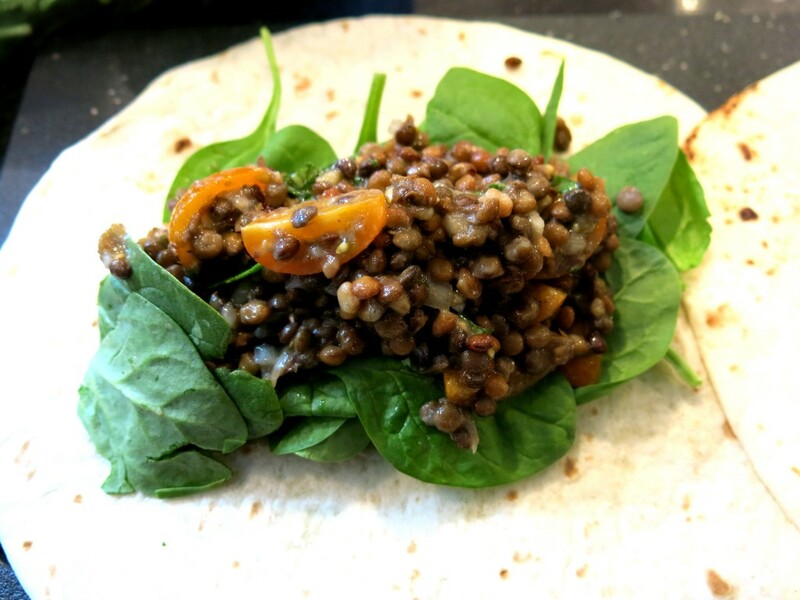 Wanting something different then a hummus wrap or a seitan wrap, but still an easy to eat wrap, I grabbed a package of precooked lentil that I purchased at Trader Joe’s. I kept it real simple. The lemon and basil combination was just perfect with a touch of olive oil, salt and pepper. Throw in some finely diced onions and quartered cherry tomatoes and you are good to go. This took me less then 10 minutes to prep and as it sat in my cooler the flavors developed even more making it taste amazing when I finally ate it hours later. I tucked some spinach leaves in the wrap for more healthy goodness. When I make this again to eat at home I would want to just eat is as is or add a big scoop of it on top of some raw greens for a nice salad. Either way is great. Using pre-packaged already cooked Lentils is a huge time saver in this recipe. Feel free to cook your own though! You might have to adjust the seasoning on it though since the Trader Joes's lentils are slightly seasoned. Combine all ingredients in a medium size mixing bowl. Season with salt and pepper to taste. Eat as is. Use is a wrap with some spinach or enjoy a big scoop of the salad on top of raw greens. I don’t often get that many chances to eat at the Cinnamon Snail. They mostly spend their days in NYC. For us in NJ they are at the Red Bank Farmers Market on Sundays which we won’t go to in the summer because the traffic home is an absolute nightmare! On Thursdays they are in Jersey City at the Grove Street Farmers Market. We are close to J.C., my sister lives down the street from the market, but it’s still rare that I can go. I usually try to go when my sister is teaching a craft class at her friends shop called Kanibal Home. The keyword in that sentence is “try”. Even when I’m in town on the right night I usually still miss it because parking takes forever, the lines are crazy long and then I’ll miss the class I’m taking. Last night though everything went perfectly! We found 2 parking spots right away. (One picking up my sis and one in front of our friends shop). Since we were early from not circling for 1 hour looking for parking I left everyone at the store and speed walked to the market. The market wasn’t there but the Cinnamon Snail still showed up! Thank goodness because I was starving! The line also wasn’t as long as other lines I’ve encountered there. I’ve waited 30 minutes to order and just as long or longer to get my food. Its worth it though! For dinner I chose an old favorite of mine the Lemongrass 5-Spice Seitan. It has curried cashews and wasabi mayo among other things. Its incredible! I really wanted to pick up some donuts, especially a creme brule donut, but by the time I got there all the donuts I wanted were sold out. Most of the pastry case was empty. It was quite a sad sight. I decided to try 3 new pastries that I haven’t ordered from them before. First up for the pastries was a berry and cheese danish. 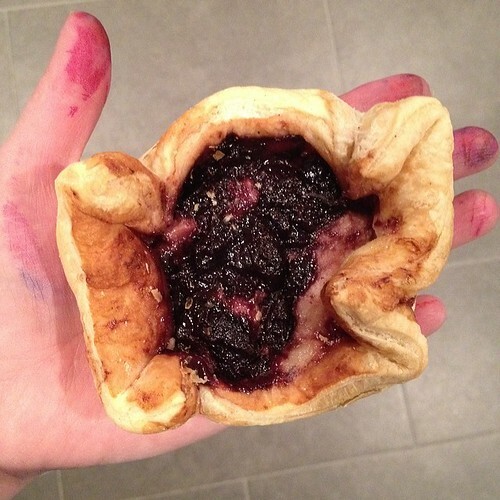 I had it as a late night snack when I came home from the class with ink stained hands. It was really good! I never was a fan of Danishes in my pre-vegan day’s. I love them now though! 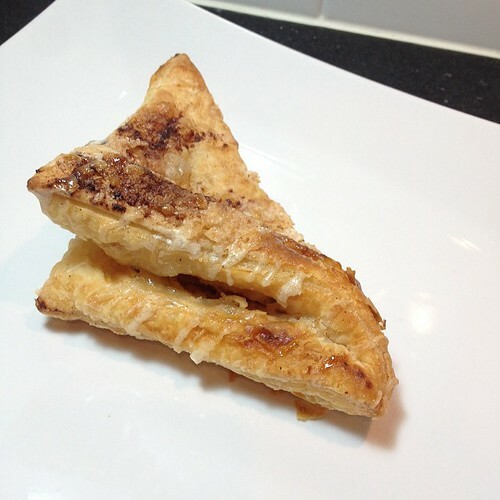 Breakfast today was a Pear Turnover with Lavender. This was even better then the danish above. I was wondering what they did to get the lavender flavor that was so prominent, in a good way, so I opened the danish up and saw actual lavender flowers mixed in with the pear filling. I’ll definitely be buying this again. 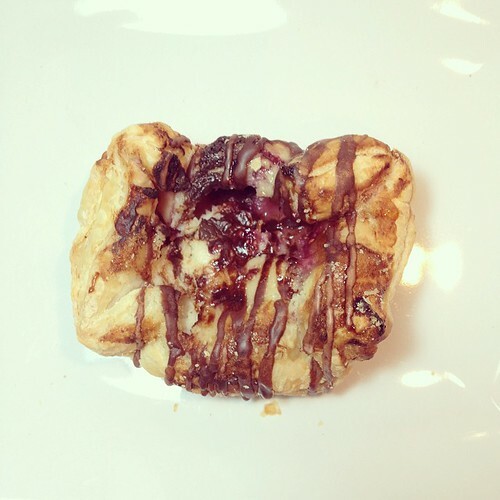 The one pastry I haven’t eaten yet is a Chocolate Raspberry Danish. I’m sure it’s just as great as the other pastries I’ve eaten in the last 12 hours. :) I might even share it with my husband tonight after the kids are in bed. 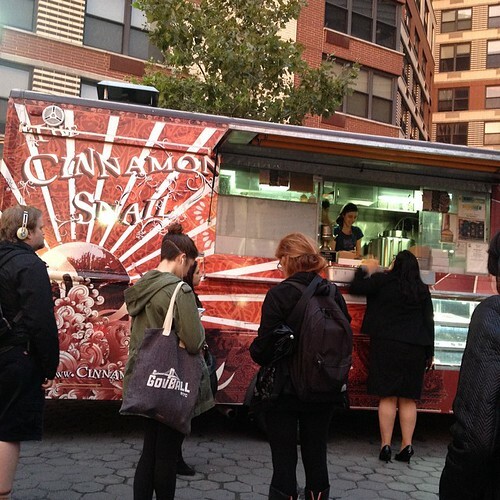 For anyone visiting NYC or NJ if you have a chance to eat from The Cinnamon Snail please do. You will not regret it. They are amazing! You also need to visit my friends Kristen’s shop in JC called Kanibal Home. She stocks it with amazing refurbished vintage furniture, clothes and curiosities among other things. I’m a chocoholic. I drink it in my coffee every morning and I eat some form of chocolate every day. Its quite possible you’ll see chocolate pop up again in my final post tonight in this one day series. We had lunch al fresco today on our back deck. 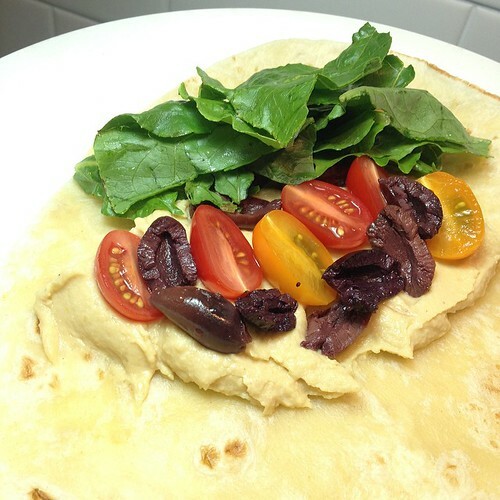 A PB & J for my 3 years old and a Hummus Wrap w. Tomatoes, Kalamata Olives and Romaine for me. I love all the different colors in this meal! I rolled it up into a nice tight little wrap when I got outside. It was perfect. 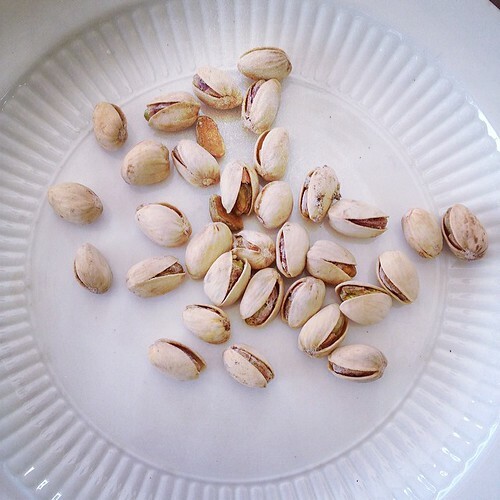 For an after lunch snack I had some Salt and Pepper Pistachio Nuts. 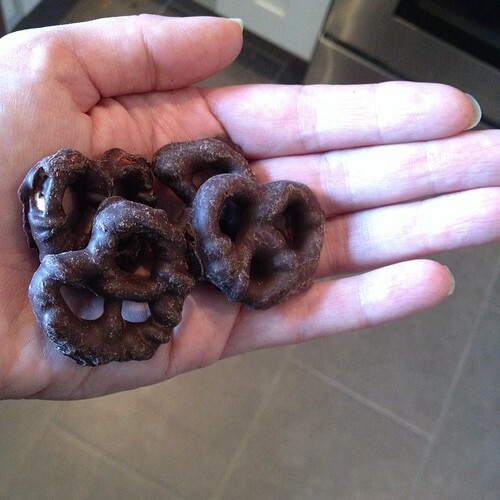 They are so addictive and it’s hard to stop eating them! After I finished the handful above I had at least another half of a handful. Not Pictured: A second Iced Almond Milk Mocha. I only had a small about of cold french pressed coffee left over so I though why not. Now I just need to drink a lot of water for the rest of the day!